The much-anticipated 29th Salon International de la Haute Horlogerie (SIHH) ran from the 14th to the 17th of January in Geneva. This fantastic event had over 23,000 visitors and saw a vast range of brands launching their brand-new timepieces. 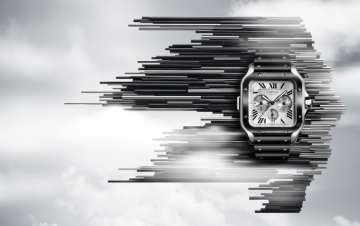 With an increased focus on digital technology and innovation, this SIHH edition relied on a powerful digital communications strategy, attracting a large audience outside the venue. The #SIHH2019 hashtag was trending during the four days of the event and almost 260 million people worldwide were reached on social media. Bigger and better, this year’s SIHH exceeded all expectations and set a new standard in the horology world. The SIHH occurs every year in Geneva, a place rich in tradition and the home of watchmaking. This year’s event was all about interaction and innovation; the creation of the LAB allowed exhibitors to showcase innovations in digital technology, including artificial intelligence, virtual reality and augmented craftsmanship. This focus on technology even gave attendees the opportunity to get a digitally-designed tattoo at the Studio. Packed with panel discussions, brand presentations and keynote speeches, this SIHH edition revealed many watch trends for 2019, as well. From perpetual calendars and moon phases to one-of-a-kind collector’s pieces and original alloys (based on elements such as carbon and recycled titanium), this event saw it all. Colour was also incredibly important at this SIHH, with blue and green continuing to grow in popularity. SIHH gathered 18 of Switzerland’s best watchmakers, many of them from the Richemont group, and also exhibited 17 independent brands. Famous personalities from around the world also made appearances and admired the fantastic pieces on display. This included brand ambassadors, actors, athletes and writers. The key highlights of the event were, of course, the many beautiful and sophisticated watches exhibited. There were many notable pieces at this year’s SIHH, so we found it difficult to choose our favourites. In the end, we chose the Cartier, IWC and Hublot brands due to their innovative spirit and the brilliant new watches they showcased this January. 2018 saw the reinvention of the Santos collection, a true icon of horology; launched in 1904 and designed for pilot Alberto Santos-Dumont, the Santos is the world’s first pilot’s watch. At this year’s SIHH, Cartier showed a new addition to the collection with a set of chronographs. Only available in extra-large size with a 43.3mm width, this piece is nonetheless elegant and not bulky. There are three different case options; stainless steel with a black ADLC steel bezel, stainless steel with an 18k yellow gold bezel, and solid 18k rose gold. Each piece comes with a selection of bracelets you can choose from, allowing you to transition from an everyday watch to an evening piece effortlessly. Cartier fans will have to wait until April to purchase the new Santos Chronograph, but the wait is certainly worth it. Meanwhile, you can browse other Cartier watches at our Lancaster and Kendal stores. IWC watches are always designed and crafted to the highest of standards. The new additions to the Top Gun collection are no exception to this well-known rule. These tactical pieces pay homage to the famous flight school and are crafted from new materials and top-notch movements. With advanced technical specifications, stunning innovations and gorgeous aesthetics, these four new watches are specially designed with robust materials to meet the requirements of elite jet pilots. The matte black ceramic case, for example, ensures that pilots are not distracted by sunlight reflecting on the piece while they fly. These new Top Gun timepieces feature Ceratanium® for the first time. This durable material was developed by IWC and combines the properties of both titanium and ceramic. This material is also lightweight and unbreakable. Hard and scratch-resistant, as well as corrosion and humidity-resistant, the watches are perfect for daily use and can withstand extreme G-forces. Pilot’s Watch Double Chronograph Top Gun Ceratanium – Showcasing a striking matte black colour, this sleek watch has an integrated split-seconds hand mechanism for measuring two different periods of time. 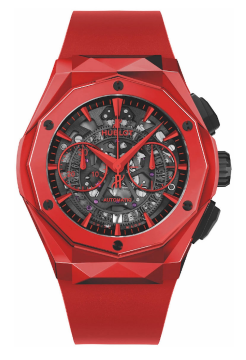 It also houses a self-winding 79420 calibre and has a power reserve of 44 hours. Pilot’s Watch Chronograph Top Gun – With this piece, IWC incorporated the 69000-calibre family into their Pilot’s watches collection for the first time. The watch comes with water-resistance of up to 60 metres, a power reserve of 46 hours and a small-seconds hand that offers a pop of red against the black dial. 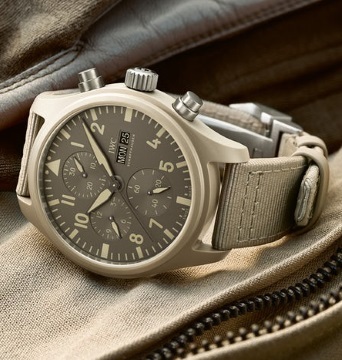 Pilot’s Watch Chronograph Top Gun Edition “Mojave Desert” (image) – Limited to only 500 pieces, this is the first watch with a case made from sand-coloured ceramic, a colour inspired by the Mojave Desert. Perfectly matching the uniforms worn by US Navy pilots, this hue results from a combination of zirconium oxide and metallic oxides. The pawl-winding system has a power reserve of 46 hours and the chronograph is powered by a 69380 IWC-made calibre. Pilot’s Watch Automatic Top Gun – The simplest watch in the collection, this model is nonetheless just as stunning as the others. It comes with a 41mm black ceramic case, a power reserve of 72 hours and an in-house 32110 calibre. French contemporary artist Richard Orlinski teamed up with Hublot to create unique additions to the eclectic Classic Fusion range. Featuring a one-of-a-kind mix of folds, facets and ridges cut in either titanium or ceramic, these novelty editions showcase beautiful sharp-edged 3D sculptural lines that are characteristic of Orlinski’s works. This eye-catching selection of watches is truly unmissable for Hublot fans everywhere. The Classic Fusion “Orlinski” Red Ceramic (image) watch debuted at the SIHH 2019 and is limited to 200 pieces. With a 45mm case and angular bezel, this watch was in research and development for four years and uses a special process that fuses pressure and heat to create the material, without burning the pigment. The complete in-house process is mostly a trade secret, protected by several patents. This crimson statement piece comes with a skeletonised chronograph movement and a 42-hour power reserve, as well as a clear sapphire caseback. Because the piece is hard-wearing, it’s a fantastic choice for everyday use or for special occasions where you want to make a powerful visual impact. The Classic Fusion Tourbillon “Orlinski” Sapphire watch is a limited edition with only 30 pieces available worldwide. This piece boasts pure transparency, from its 45mm polished sapphire case to its smooth rubber strap. The skeleton Tourbillon movement was hand-assembled and aims to counter the effects of gravity by mounting the escapement and balance wheel in a constantly rotating cage. A watch where performance meets art. Another great piece is the Classic Fusion Tourbillon “Orlinski” Black Magic watch, which is powered by the HUB6021 calibre and comes with a stunning 5-day power reserve. The manual-winding Tourbillon movement is an engineering masterpiece and the matte black colour of the faceted design adds a further touch of sophistication to such a unique watch. There are only 30 pieces available worldwide. Also limited to 30 pieces, the Classic Fusion Tourbillon “Orlinski” King Gold watch houses the powerful HUB6021 manufacture manual-winding Tourbillion movement, which ensures accuracy at all times. In addition, the 18k king gold offers a beautiful contrast to the black rubber straps. Another watch that fans of the brand will love. Just like other Hublot watches, the Orlinski editions are reliable, innovative and creative. These are just some of the stunning timepieces exhibited at this year’s SIHH, and we already can’t wait for April 2020, when the next event will take place. If you also want to explore new watches or browse your favourite brands in person, visit us in Lancaster or Kendal.